What an innovative product . 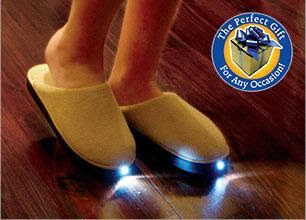 . .
Kim from Shop with Me Mama is giving away a pair of these BrightFeet Lighted Slippers to three lucky readers. These slippers come in colors and prints suitable for both men and women. They would be perfect for my husband who is very accident prone, especially in the dark. There are lots of ways to earn extra entries, including daily tweets. This contest is open to U.S. entries only. You may enter through January 8th, 2010 10pm PST.